In September of 2018, Melanie shared a big key to success - always put your best foot forward. Today, we will learn how to overcome one of life’s contradictions: How do I stand out while fitting in? 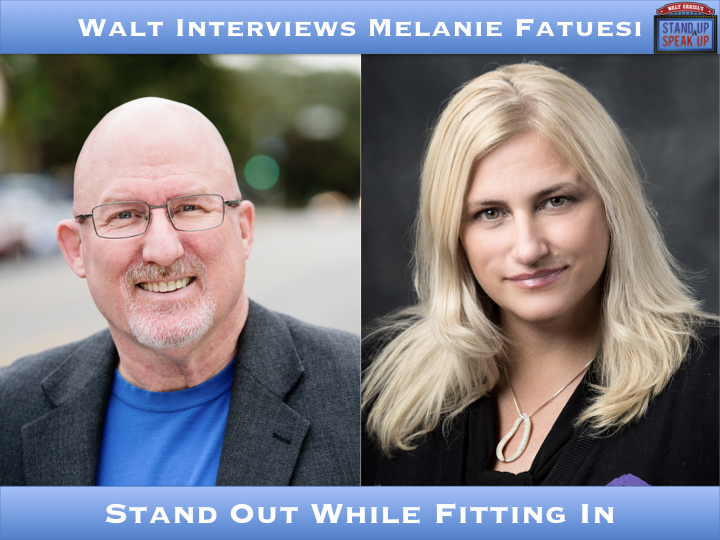 Melanie Fatuesi was born and raised in a small auto manufacturing town in Michigan. At 18, she joined the Army and traveled the world, from Somalia to Guantanamo to Korea. After ending her service, Melanie worked as a Government Contractor in Italy. In 2009, she returned to the US. While volunteering with the Chapin Marching Band, she was offered a position with the local Dale Carnegie Group. She started as an office assistant and quickly transitioned to one of El Paso’s most sought-after up-and-coming speakers. She currently recruits nurses for a major corporate hospital, in addition to her many speaking engagements. She serves on the board of Big Brothers Big Sisters. She is featured as on-air talent with El Paso’s local PBS station KCOS and served on their board of directors from 2014-2016. Melanie has won several awards for speaking, and for her recruiting performance. She is most proud of accomplishing the Distinguished Toastmaster award from Toastmaster International. Melanie has one son, Luka who recently graduated from and works for Stanford University.